Using the latest 3D high-definition laser scanning equipment and high end 3d modeling software, Landpoint is able to create as-built intelligent models with incredible accuracy. This technology is particularly useful for oil and gas development. 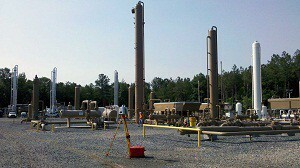 In 2011, Landpoint created an as-built model of a portion of a gas processing facility in Haughton, Louisiana. We used this innovative technology to create a model that is within ¼ inch accuracy in just ¼ day. While using only four scanning positions we were able to capture a full 360° detailed view of the facility towers, and the entire project took only 14 days to complete. Before the development of 3D laser scanning, a project of this scope would have taken much longer and resulted in far less accurate data. With this detailed model, multiple departments can work together to plan future expansions, renovations, or assess the status of current assets already on the ground. This collaboration results in better planned oil and gas development projects and faster results. 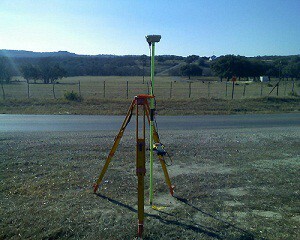 3D Laser Scanning data and BIM go hand in hand. BIM, or Building Information Modeling, is the technology of the future being used on today’s complex construction projects. It imbeds relevant information into the data of the model such as materials, part sizes, flow rates, tensile strengths, maintenance schedules, life spans, part locations and many more. Scanning is a huge benefit to the BIM process serving as the foundation for renovation, addition or improvement projects or as an effective means to compare As-Built plans to the design model during construction. This significantly reduces costly RFI’s (request for information), mistakes and rework. This ultimately cuts down on the overall time and money spent on your oil and gas development projects. To learn more about how Landpoint and 3D high-definition laser scanning can bring success to your oil and gas development project, contact us today.